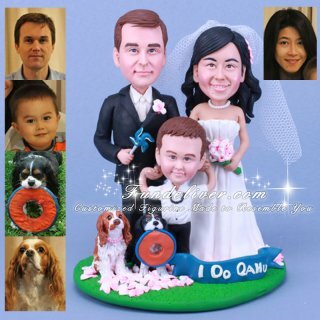 This is a completely customized wedding cake topper with bride groom and child ordered by one of our customers. They would like groom and bride to be holding their son’s hands, two dogs in front and a ribbon sign on bottom saying “I Do Oahu”. Bride is with long wave hair, white strapless dress, pink Plumeria bouquet, pink Plumeria hair flowers, short veil and engagement ring. Groom is in black tux, black shoes, pink Plumeria corsage and holding a toy windmill. This toy was made by their son on the day they took that photo for this project so it would be a nice reminder for them. Their son is in white half sleeve shirt, black trouser, black shoe and wearing a Kukui Nut Lei. Momo (the bigger dog) wears pearl necklace and Pinot (the black dog) holds a frisbee in mouth. They’d love to place a rock behind groom and bride. In real life, the rock is found on the private green grass yard of the beach house they'll get married. 10.10.10 is craved on the rock facing opposite direction. For base, they would like a round one that has green grass with flower petals (pink/white Plumeria which matches with bridal bouquet and groom's corsage) from left bottom to top right corner. 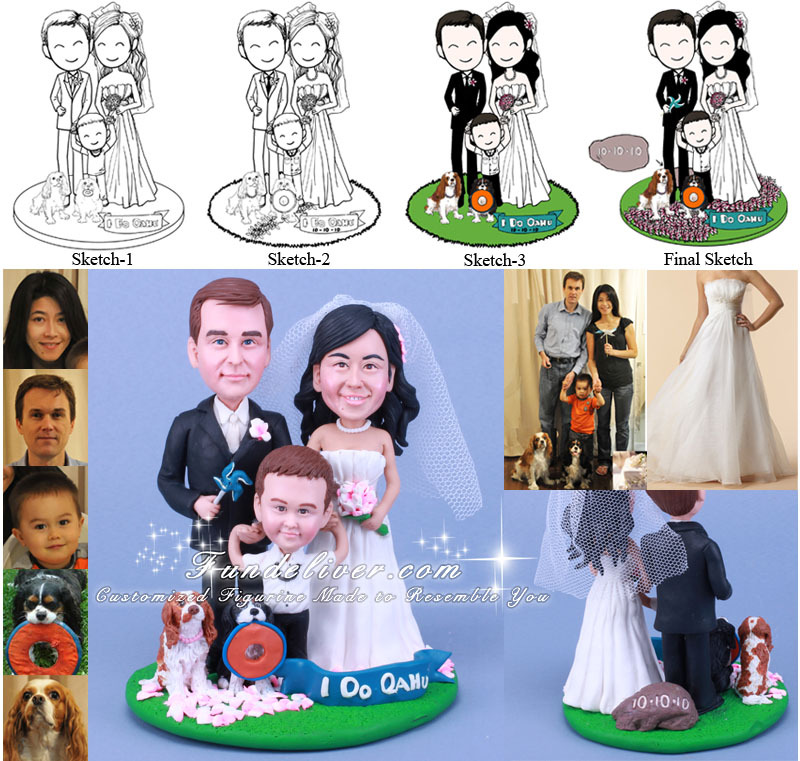 Don’t forget to check our another family cake topper, these will be a great keepsake for your whole family.